Reverend Gina Campbell welcomed worshippers, declaring the Washington National Cathedral "a place of prayer for all people." "Let us stretch our hearts and let us seek to deepen mercy for we worship the same God," she told the men and women sitting separately in rows, on the floor before her. "If we do not stop them at the monasteries, they will make their way to the mosques," he said. The idea came to the cathedral's director of religious liturgy, Rev. Gina Campbell, and South African Ambassador Ebrahim Rasool, who is a Muslim, when they organized an interfaith memorial service for Nelson Mandela last year. In an interview with VOA, Rasool said he hopes some day non-Muslims will be allowed to pray according to their own traditions even in mosques in Saudi Arabia, the birthplace of Islam. 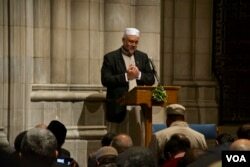 Friday's worship by Muslims in the historic American church provoked a backlash from conservative Christians. Just before the prayers started, a protester jumped out in front of the bank of TV cameras and shouted “Jesus died on that cross!” She was escorted away. The carpets were arrayed diagonally in the transept, to the side of the sanctuary, so that worshipers can face in the direction of Mecca without seeing crosses or Christian icons. Muslims are not supposed to pray in view of sacred symbols alien to their faith. Ambassador Rasool said the service is meant to be both a symbol for America's three million Muslims to feel welcomed in its predominantly Christian society, as well as for Muslims in countries where they are the majority, to show hospitality to people of minority faiths.